Meet Allalena! Emma got her for Christmas, and she has been the source of great joy, creative play, and creating! Johnny and Emma worked together to come up with her beautiful name. Allalena came with an extra outfit (Hooray, Costco, for selling beautifully-made, affordable 18-inch dolls who come with accessories!!! ), and Emma loves changing her clothes. She also loves making her accessories. 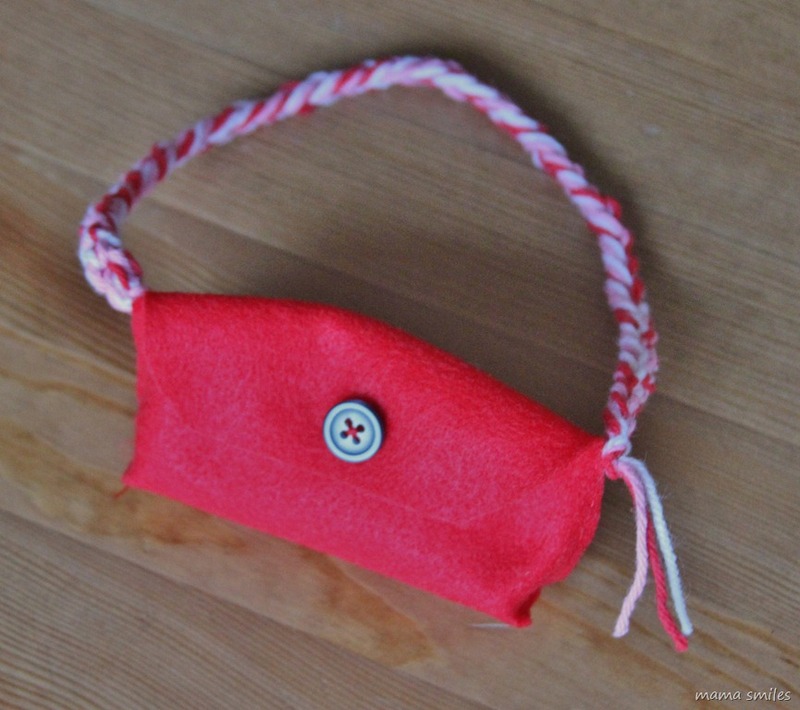 We worked together to design this simple doll bag pattern, which Emma sewed all by herself (I chained three strands of yarn together to make the strap and sewed on the button). Felt is super-easy to stitch, you don’t have to worry about fraying, and Emma has enough experience that she stitched this together easily, once I showed her which side to sew where. We left the stitching on the outside because I like that look, but you could also stitch and turn the bag right side out – or even sew this on the machine. We used craft felt; proper wool felt wouldn’t reflect the light like this in photos. 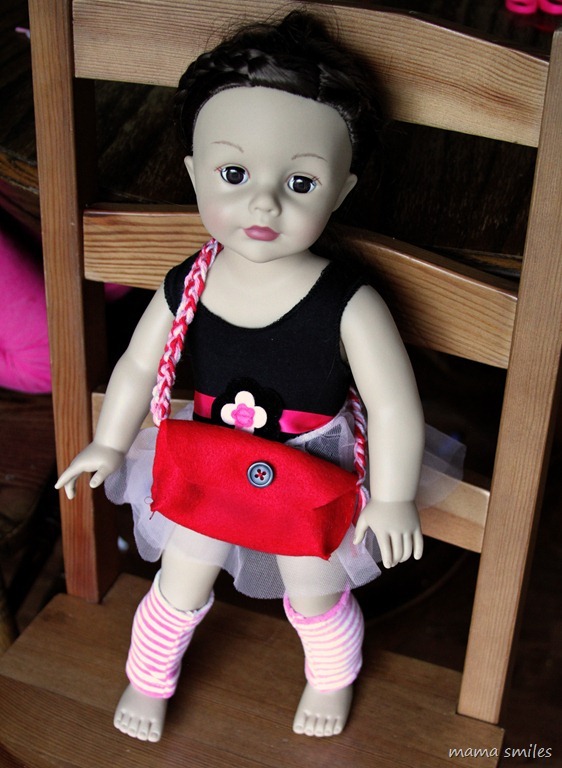 Just in case there are other dolls in search of bags, I uploaded our doll bag pattern here, complete with instructions. In addition to being a doll accessory, I think these little bags would make darling party favors! Once your child is ready to give machine sewing a go, check out this tutorial for a simple felt bag kids can sew! Allalena is very lucky to be in the hands of your talented and creative Emma. She is going to be one beautifully accessorised doll and better still all her accessories will be one of a kind and hand made. Very special indeed. That is so cute. R really wants to learn how to sew, but I don’t know how either. I’m hoping to work on that this year. I’m going to add this to our to do list. That doll is cute. My in-laws buy R an American Girl doll every year and I think they are so overpriced. So sweet! I also want to start teaching Anna to sew this year, but I think it makes sense to wait until she is about 5.5 and can do more independently. That makes sense. Emma turns six next month, and I’ve definitely seen a big jump in her ability to complete projects like this in the past six months or so. I just love the name! What a blessed doll, to have such a beautiful name and a pretty handbag, too. Great combination! Reminds me of The Big Green Pocketbook story my kids pulled out for us to read today. That is so cute! That’s great that she was able to sew it herself. I’ve seen those dolls at Costco and they are awesome! Great project for a beginner! Thanks for sharing!!! I need to help Batman finish his monster. He keeps asking me and I keep not following through, it’s one lousy seam……….. The purse is so cute! What a very very cute bag! Love it. 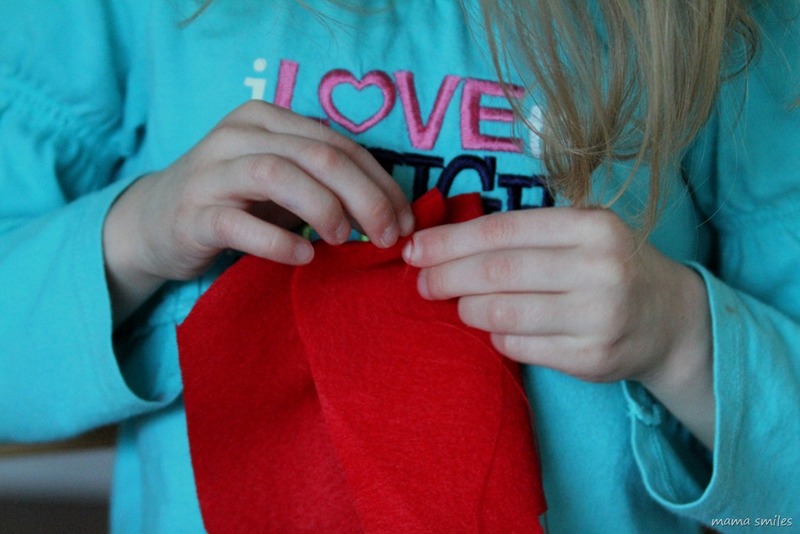 A great way to get kids started on sewing! Oh, my daughter is going to love this. Thank you! I really like the idea of incorporating sewing into the children’s art studies. We explore such a variety of art and your projects make me want to add in sewing.